Internationale Betrekkingen Concepten (17-18) This file contains all the concepts from the book "Global Politics" that had to be known in the academic year 2017-2018 for the course International Relations. The point reached for this course is 13/20. Readings semester 2 IP Summaries of the readings for International Politics semester 2 BAIS year 2. First 6 lectures. UNIT 3D - Structure of Global Politics Revision Resource For A2 GLOBAL POLITICS STUDENTS. CONTAINS ALL TOPICS ON UNIT 3D. UNIT 4D REVISION GUIDE - Human Rights For A2 GLOBAL POLITICS STUDENTS. CONTAINS ALL HUMAN RIGHTS TOPICS ON UNIT 4D. Main principles of realism Study notes on a level edexcel government and politics unit 3D approaches to global politics. Provides key information of key principles of political realism broken down. Edexcel Government & Politics Unit 4 Notes My Edexcel G&P Unit 4 Notes compiled throughout the year so far from lesson work and my textbook. I got an A in the subject last year and an A in my mock this year from using these notes, focuses on global politics, with case studies, and global financial institutions. Unit 4D Global Politics Revision Notes Condensed Version For A Level Global Politics students. Offers condensed notes of all Unit 4D chapters from the Andrew Haywood book itself. To what extent are Human rights protected in the modern world? 45 marker - Unit 4D For A level Global Politics. To what extent has globalization reshaped international politics? (45) - Unit 3D For a level global politics students. To what extent does nuclear proliferation threaten peace and security? (45) - Unit 4D For all a level global politics students. In what ways did 9/11 redefine the nature of terrorism? (15) - Unit 4D For a level global politics students. Explain the implications of bipolarity for peace and international order. (15) - Unit 3D For a level global politics students. What is the concept of suprantionalism and why has it been controversial? (15) - Unit 3D For a level global politics students. What is the balance of power and how effective is it in preventing war? (15) - Unit 3D For a level global politics students. Distinguish between economic globalisation and political globalisation. (15) - Unit 3D For a level global politics students. 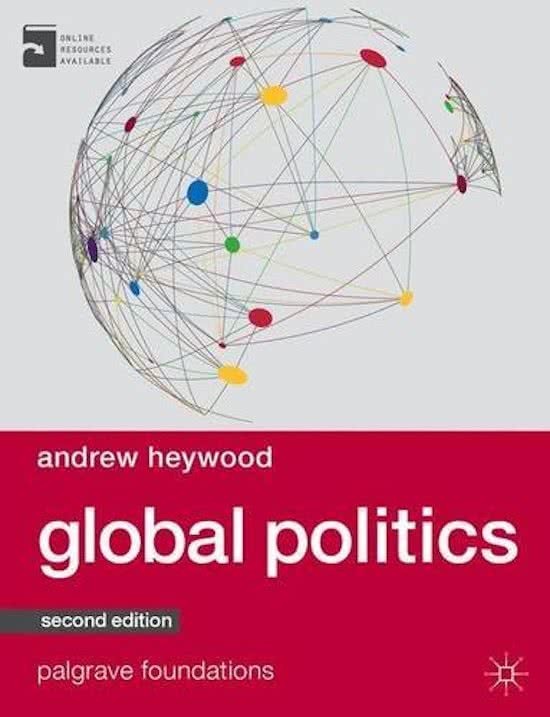 On this page you find summaries, notes, study guides and many more for the study book Global Politics, written by Andrew Heywood. The summaries are written by students themselves, which gives you the best possible insight into what is important to study about this book. Subjects like government and politics, Global Politics, global politics, unit 4d, Government and Politics, A2 Government and Politics - Global Politics - UNIT 3D, A2 Government and Politics - Global Politics - Unit 4D & A2 Politics will be dealt with.